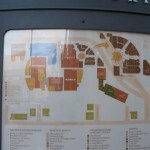 Part of the reason Labelscar exists is because tons of enclosed shopping malls have been turned inside out to plazas or lifestyle centers in the last decade, but we’ve actually talked fairly little about the results of these transformations, in part because our focus has been on preserving bits from the old versions of these centers. Sometimes the new product is just as interesting, or at least worthy of discussion. This is a set of photos I took back in February at the former Huntington Beach Mall in Huntington Beach, California, down in Orange County. 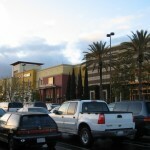 The center has since been renamed and re-christened “Bella Terra,” and it sports a cross section of stores that supplements the larger Westminster Mall an exit up the freeway, instead of trying to compete with it. First, a brief bit of history on the old Huntington Beach Mall. 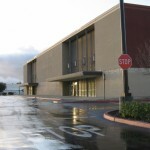 The center originally opened in 1965 at Edinger Ave & I-405 as the first fully enclosed shopping mall in Orange County, with The Broadway, Montgomery Ward, and JCPenney as anchors arranged mostly in a dumbell fashion. 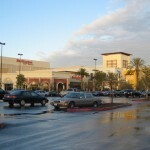 The Huntington Beach Mall was expanded with a new Mervyn’s-anchored wing in 1986. Unfortunately, competition from other malls in the area began to have their impact by the early 1990s: JCPenney shut their store in 1992, and The Broadway went out of business in 1996. The mall closed for good in 2003. 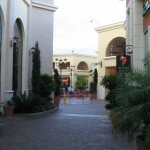 Instead of turning the Huntington Beach Mall into a lifestyle center or a big box center, the developers (Bella Terra Associates) went for something about halfway inbetween, where the focus of the center is on a cluster of big box anchors and a movie theatre, with a small pedestrian court sporting a variety of dining options and higher-end street furniture with an Italian village feel, such as fountains and landscaping. The result is a very pleasant center that still retains some sense of the sense of “place” you’d find in larger lifestyle centers or malls. At the same time, the groovy, Googie-style architecture of the massive The Broadway store was cleaned up and retained for Kohl’s to fill the space. The problem with the Bella Terra development may well be the small size of the pedestrian friendly area, however. Although it’s designed mostly for dining and theatre patrons, the area feels too small to generate much foot traffic or critical mass and it’s questionable how successful it will be in the long term without that degree of a draw. 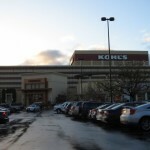 Plus, Kohl’s, Mervyn’s (who was a tenant), and Burlington Coat Factory don’t feel very serendipitous with the higher-end dining options, the movie theatre, or the Barnes & Noble store. 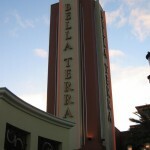 On the one hand, Bella Terra is trying to be a convenience-oriented, apparel-heavy, female-skewing big box center, and on the other it’s trying to be an upscale suburban nightlife and lifestyle retail destination, but frankly it’s too small to balance both of these acts. There is one carrot here for dead retail enthusiasts. 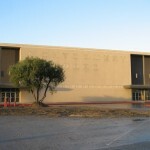 The mall’s original Montgomery Ward store still sits completely abandoned at the mall’s western end because the parcel is owned separately from the mall itself. The store looks especially sad and derelict, and given the amount of attention paid to the redevelopment of the rest of the center it’s somewhat shocking that this parcel was never reused. Is the old mall entrance to Wards visible? And I bet the vacant Mervyn’s will be an eyesore too, huh? @Jonah Norason (Pseudo3D), yup. The old mall entrance is visible in photo #4. Something also tells me that once the economy improves, the center will try to connect more fully to the former Mervyn’s while Wards will be flattened for redevelopment. This seems like a big box-ish counterpart to Paseo Pasadena , which also was carved out of dead mall and wound up with an “exotic’ sounding name. @Rich, I believe you’re referring to Paseo COLORADO (formerly Plaza Pasadena) in Pasadena. I grew up in this area (literally in between the Huntington Center and Westminster Mall) and have a lot of good memories of this mall. I received my first stereo (with a CD player!) from the Montgomery Wards, along with my first 10-Speed. My mother shopped at that Mervyns all of the time, and my junior high band would perform concerts inside of the mall. As a teenager, we preferred hanging out at the Westiminster Mall because there was a lot more “teenagey” things to do – even by 1992, the Huntington Center was kind of dead. Wow, just wow. The landscaping/design firm really went all out on this project. They made the Mervyn’s building look incredible, which is something I can’t say about any other Mervyn’s. Bella Terra’s dynamic mix of shopping, dining and entertainment is about to get even better! DJM Capital Partners, Inc. is currently in predevelopment and planning phases for a 16-acre mixed-use expansion to be called The Village at Bella Terra. Planned for the site along Edinger Avenue, to the immediate west of the existing retail center, The Village at Bella Terra will replace the vacant Montgomery Ward store, tire shop and parking lots with a distinctive collection of sophisticated new residences, integrated lifestyle retail, more unique dining options and a vibrant open-air park and plaza. So there you have it. That was made in summer ’08, before the economic/housing collapse. PLANNING STAGES in ’08, at that. KOHLS oddly took over the entire Broadway location. They built the store only on the first two levels of it. The third was closed off, the escalators covered in drywall and who knows what is up there. The former JCPenney / Current Burlington Coat Factory was never remodeled on the exterior, and is partly hidden by the parking structure. Whoa, whoa, whoa. You’ve confused B&N with Borders. I like the idea, it’s like a mall with no ceiling. It’s sad to see it so empty though, hopefully it’s outlook would improve in the coming years. Before several strokes of bad luck (Penney’s moved to a bigger store in Westminster Mall, and Broadway and Monkey Wards died), Huntington Center was a small but excellent mall. Parking and access were a snap and there was an excellent mix of tenants. Watching the mall die was a long, sad process. The new “Bella Terra” (with it done-to-bloody-death “Tuscan” theme) it a nighmare of traffic flow and bad planning. Instead of an easy stroll through an enclosed mall, one now must walk through a too-small, too-busy parking lot to get from one store to another. Worse yet, *most* of the parking is around the back in a parking structure that isn’t anywhere near store entrances. It’s almost like they went out of their way to make things inconvenient. And If you want to go from one end of the mall to the other, you’ll probably need to get in your car and drive. Without a central pathway between the buildings, one must walk all the way *around* this huge complex. The tenants, of course, are mostly big chains that you can find within a 10 or 15 minute drive in almost any direction. For years, community “leaders” talked up this redevelopment project like it was the second coming of Christ. I would’ve settled for a walkable environment, good parking, and some interesting shops. Can anyone explain WHAT they were thinking when they built this mess? I remember when I was little I used to goto the Barns & Noble over there. I don’t remember why my mother would sometimes go to that one in particular. Though I remember that huge dead mall gave me the willies.Though around the mall seemed to be thriving business. There was Sports Chelate down the road, a strip mall with a Babie-R-Us , a wonderful North Indian restaurant and a BJ’s that all gets a lot of traffic. The Strange thing is the the large business buildings across from it by the highway have lots of business too. I remember when the whole Bella Terra business started coming up. I don’t go there much any more except to visit the Indian food place. It’s also very close to Old world. The Serious things was creepy about the whole dead mall was the economic area’s around it seemed to be fine even thriving without the mall. The various strip mall, restaurants and other places where fine. Hopefully the Bella Terra will survive and we won’t have another creepy mall to look at specially a a bad Old world look a like. I remember the mall back in 1968 when I was about 3 1/2 and it was very beautiful for its time. I’m sorry you only remember the closed down mall which doesn’t reflect what the mall originally was. It definitely was not creepy. The good memories of the Huntington Center are left to those of us in our 40’s and 50’s. After having seen it yesterday, the only part I recognized was the old Broadway building used by Kohl’s. It makes me sad to see the center the way it is now. 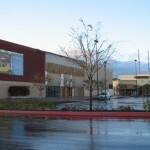 as of December 2011, both Montgomery Wards and Mervyns have been demolished and the construction of the Costco is underway. OC big malls mean big money for cities & county. The Orange County retail market again fared better than the national industry last year. Combined taxable sales for 14 big shopping centers in Orange County rose 6.5 percent to $4.9 billion in 2011, based on statistics provided by cities. By comparison, sales for U.S. shopping centers increased 4.2 percent to $2.3 trillion in 2011, according to the International Council of Shopping Centers. In 2010, taxable sales for those same 14 local malls climbed 5.4 percent, while U.S. shopping center sales grew by less than half that rate, at 2.3 percent. Also, it bodes well for the local retail industry as Orange County continues to outpace the U.S. in its economic recovery. In May, the Orange County unemployment rate was 7.5 percent, vs. 8.2 percent for the U.S. Taxable sales at seven local shopping centers rose nearly 5 percent, to 12 percent, last year. At six centers, they increased less than 2 percent. One center saw a drop. Eight malls did better in 2011 vs. 2010. Percentage gains slowed down for the other six malls. At ritzy South Coast Plaza, which is in both Costa Mesa and Santa Ana, taxable sales rose 10.6 percent last year, to about $1.27 billion. In 2010, they increased 8 percent, according to statistics from the cities. A mall official said taxable sales grew by a double-digit rate to $1.4 billion in 2011 and are projected to reach $1.5 billion for 2012. “We attribute the increase in sales to a strong demand for luxury goods and our global reach as a shopping center,” said Debra Gunn Downing, executive director of marketing for the mall. The first West Coast Patek Philippe, a high-end watch brand, recently opened at the 2.8 million-square-foot center. It will also get three more luxury watch retailers: IWC Schaffhausen, Jaeger-LeCoultre and Vacheron Constantin. High-end denim brand Joe’s, luxury clothing label Barbara Bui and premium shoe designer Kurt Geiger will also open shops at the center. When malls do well, cities benefit. 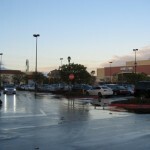 For example, Costa Mesa last year received $12.5 million in sales tax revenue from South Coast Plaza. At Fashion Island in Newport Beach, taxable sales rose 9.9 percent to $630.2 million last year. In 2010, they jumped 13.2 percent. The 1.5 million-square-foot mall marked its 45th anniversary this year with the completion of a $100 million makeover that began in 2009 and included new stores and restaurants. At the 1.6 million-square-foot The Market Place in Tustin and Irvine, where Howard’s Appliance and Flat Screen Superstore opened last year, taxable sales rose 11.3 percent to $407.4 million in 2011. 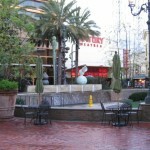 At the 1.2 million-square-foot Irvine Spectrum Center, taxable sales climbed 7.3 percent to $339.6 million last year. At The Outlets at Orange, which changed its name from The Block at Orange last September, taxable sales jumped 11.6 percent to $162.5 million last year. That’s on top of a 9.7 percent jump in 2010. “The figures show the continued gradual change from an unfocused center into an outlet center,” Stoffel said. In 2007, Simon Property Group bought The Outlets from The Mills Corp. “We anticipate continued success, which will also offer long-term value to the tourism economy and the local market,” said Kristin Elfring, general manager for the mall, which spans 800,000 square feet. 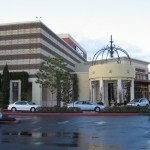 Simon also owns Brea Mall, The Shops at Mission Viejo, Laguna Hills Mall and Westminster Mall. At the 1.3 million-square-foot Brea Mall, taxable sales jumped 5.1 percent to $444.6 million last year. At the 1.2 million-square-foot The Shops at Mission Viejo, where a Forever 21 opened last September in the former Saks Fifth Avenue building, taxable sales increased 1.5 percent to $314.5 million last year. At the 867,000-square-foot Laguna Hills Mall, taxable sales rose 0.7 percent to $118.4 million last year. 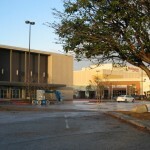 At Westminster Mall, taxable sales declined 1.6 percent to $268.7 million in 2011. In 2010, they dipped 2.4 percent. Stoffel thinks the 1.2 million-square-foot moderately priced center should draw from at least a five-mile area populated by about 500,000 residents. Besides Target, its anchors don’t have duplicate stores and the mall as a whole doesn’t have strong competition within seven miles. Australian clothing retailer Cotton On; Pink, Victoria’s Secret’s lingerie chain for college-age women; and The Limited are slated to open at Westminster Mall. “We’re very happy that our leasing efforts at Westminster are bearing fruit,” a mall statement said. 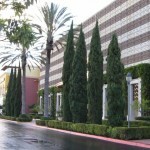 At The District at Tustin Legacy, the 1 million-square-foot outdoor shopping center that opened in May 2007, taxable sales rose 4.5 percent to $325.8 million last year. In 2010, they increased 6 percent. Stoffel thinks Costco, Whole Foods and Target are big contributors to the mall’s sales. “This doesn’t look good for the sales performance of the balance of the center. In spite of the high number of restaurants and retailers that have closed, Costco, Whole Foods and Target have done well.” In May, Best Buy shut down its location at The District – the only Orange County store among 50 nationwide that the electronics chain selected for closure. When Whole Foods opens at Fashion Island, Newport Beach and south Irvine residents “will find fewer reasons to put up with the center’s poor layout and circulation,” Stoffel said. Jeffrey Axtell, director of acquisitions and development for Vestar Development Co., which developed The District, pointed out taxable sales don’t include grocery sales and when groceries are added in, the center’s sales exceed $400 million. At the 1.1-million-square-foot Westfield MainPlace in Santa Ana, taxable sales increased 0.9 percent to $219.5 million last year. In 2010, they rose 3.5 percent. While Stoffel agrees with a MainPlace official that the center has loyal shoppers, he believes it has difficulty luring customers from a wide area because it’s near one of the county’s most congested freeway interchanges. At Buena Park Downtown, taxable sales rose 1.1 percent to $157.7 million last year. At The Village at Orange, taxable sales increased 0.1 percent to $172.5 million last year. Eric Sahn, chief financial officer for DJM Capital Partners, which owns the 839,000-square-foot Bella Terra, said 2011 sales – excluding Kohl’s, REI and Cost Plus, which do not report sales to the landlord – rose about 13 percent to $118 million. But without sales from Whole Foods, which opened in September 2010, the center’s sales were marginally better in 2011 vs. 2010. He attributes that to a lack of blockbuster hits at movie theaters and the demolition of Mervyn’s at the beginning of 2011 to make way for a Costco, which opened in May. Sahn said revenue from Costco will more than double sales for the entire shopping center and the warehouse’s presence has historically boosted nearby tenants’ sales by 10 to 20 percent. He said: “We hope this to be the case” at Bella Terra. “The focus on the restaurant and entertainment components has allowed us to increase the retail offerings at the Anchored by Ralph’s Fresh Fare, Trader Joe’s and Home Depot, the 430,000 square foot center as well,” says Sheridan.